A luxurious cream sauce can turn an ordinary dish into something special. 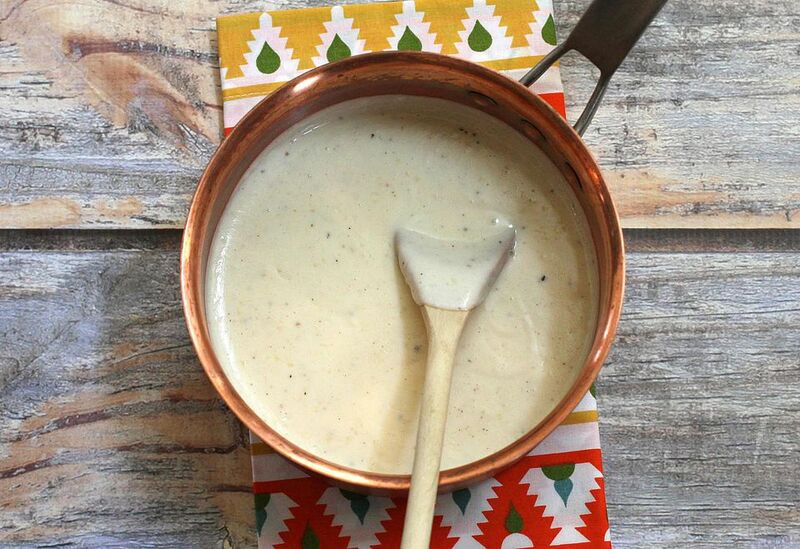 This cream sauce recipe is similar to a typical white sauce or Bechamel but is richer in taste. It is also quite versatile—add a bit of elegance with a few tablespoons of Chardonnay or other dry white wine, or sprinkle in some Parmesan cheese to give the sauce a little zing. Other types of cheese, as well as a variety of herbs, may also be used to bring this sauce recipe up a notch. Whether basic or with additional ingredients, this is a fabulous sauce to serve over chicken, shrimp, or fish fillets, and it takes just minutes to fix. You can also use it as the base for a rich and creamy macaroni and cheese by adding a few cups of shredded cheese. It's an excellent sauce to use as a binder in casseroles, too. Heat the milk in a saucepan over medium heat until bubbles begin to appear around the edge. Keep warm. Add the flour and stir until mixture is well blended. (This is called a roux.) Continue cooking, stirring, for 2 minutes. Make sure it does not turn brown. Gradually stir in the hot milk. Cook over medium heat, constantly stirring, until sauce begins to boil and thickens. Simmer, frequently stirring, over very low heat for 5 minutes. Stir in the cream and wine, if using. Season with salt and pepper to taste and add a little nutmeg if desired. The recipe makes about 1 1/4 to 1 1/2 cups of medium thickness cream sauce. The white pepper is just to keep the sauce white. If you prefer the flavor of black pepper, feel free to use freshly ground black pepper. It is important that you keep an eye on the temperature and continue to stir so that the butter-flour mixture doesn't burn. Sauté 1 clove of pressed or minced garlic in the butter for a minute before adding the flour and then proceed with the recipe. Sauté 1 tablespoon of minced shallots in the butter until translucent. Add the flour and continue with the recipe. Add 1 teaspoon of fresh chopped herbs or about 1/2 teaspoon of dried herbs at the end. For onion flavor without the texture, add a slice of onion to the milk when heating. Remove the onion slice before you add the hot milk to the roux. Add 1/4 cup each of Parmesan cheese and shredded Gruyere along with the salt and pepper. Whisk in 1 tablespoon of unsalted butter. Add 1 cup of shredded smoked Gouda cheese (4 ounces) and 1/2 teaspoon of paprika to the sauce along with the salt and pepper. Simmer until the cheese has melted. Use it in macaroni and cheese, over poached eggs, or with steamed vegetables.